Redland City Councillors today took a unanimous stand against disrespectful online behaviour by publicly committing not to ‘sledge’ on social media, and encouraging others to do the same. 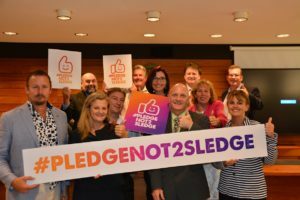 Mayor Karen Williams said councillors today voted to support the development of a #pledgenot2sledge social media campaign to encourage greater respect online and encourage more respectful online behaviour. “Recent cases in media have highlighted the tragic and life-changing consequences of online bullying and negative, abusive and disrespectful social media commentary. “The world has changed and this is a real issue being faced not only by our city, but communities everywhere. Cr Williams thanked her fellow councillors for committing to the campaign and in doing so helping to encourage respect on social media. “All councillors have taken the initiative to launch this campaign in recognition of the significant influence community leaders and adults have on the behaviour of others – we need to set the example,” Cr Williams said. “Recent discussions about cyber bullying have focussed on teenagers and youth, but we can’t lose sight of the fact that we as adults set the example and if we want to help reduce the impacts of social media on our children we need to live by the same standards we expect from them. “While councillors have started this campaign it is not about us; this is designed to set a standard within our community that will ultimately benefit our residents. “This isn’t about lecturing the rest of the community, I think politicians need to put our hands up and admit we don’t always act as we should on social media. But a bit of self-reflection can be a good thing and today councillors drew a line in the sand by committing to this campaign. “While esafety education and reporting operate at State and Federal levels, at a local level we can make a difference and together help the Redlands rise above the social media trolling and attacks. “I know the change won’t happen overnight, we are essentially looking to change what has in many respects become a culture; it will take some time and the support of the entire community but I am confident as a city we can make a difference. “Following today’s decision I will be writing to all levels of government, local schools, businesses and community groups and asking them to get on board to support the #pledgenot2sledge campaign. “I have also had preliminary discussions with the Local Government Association of Queensland (LGAQ) about rolling the campaign out across all other councils in Queensland to make this a campaign to affect communities across the state. “I will also write to Premier Annastacia Palaszczuk and ask for her government’s support. Display the #pledgenot2sledge banner and profile images, available on Council’s website, on your social media pages. If you see instances of disrespect, abuse or bullying on social media comment with #pledgenot2sledge. Do not engage beyond this with negative or disrespectful social media comments. Most importantly: don’t disrespect, sledge or abuse anyone on social media. For #pledgenot2sledge information and digital graphics to show your support, visit the Redland City Council website. If you are a victim of negative social media behaviour including cyberbullying, illegal content and image-based abuse, more information on how to get help and where to report this can be found by visiting the Office of the eSafety Commissioner website. The #pledgenot2sledge is a community social media campaign and does not replace online regulation or reporting mechanisms.